Madden NFL 13 this year merges its Franchise, Online Franchise and Superstar modes into a single suite, called "Connected Careers." We've done our best to explain what it is, but in a nutshell, gamers controlling a single player will be able to play in the same league against gamers controlling a single player (edit: and an entire team). And that's pretty damn cool. 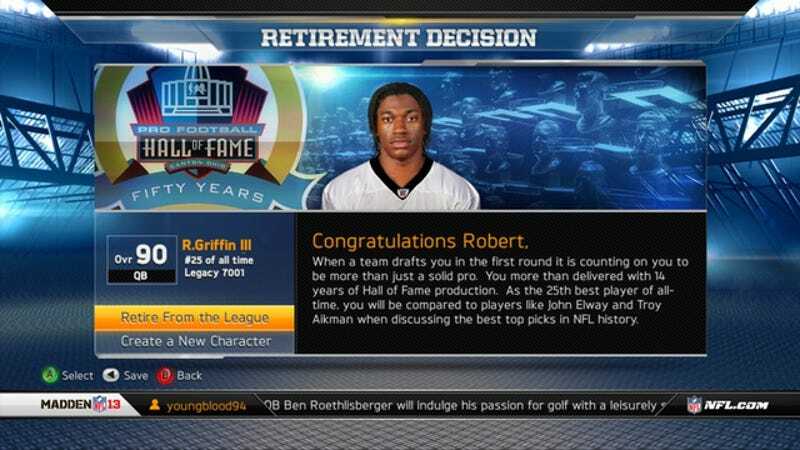 Still, franchise modes have been around for more than a decade. Some may want some lessons before they go dipping their toe into the deep end of that pool. Here, then, is a 175-page .pdf for "Connected Careers," found earlier this week by Pastapadre, which explains the new ratings given to players and coaches, and the significance of the "backstories" you'll be asked to choose when you create one. Pay attention, they do have ramifications for how you'll progress through the mode. The bulk of the manual is dedicated to team-by-team breakdowns explaining things like salary cap room, how to scout, re-sign and progress players, whether yourself or those under your tutelage. Madden NFL 13 releases Aug. 27.